It’s Monday morning, the boardroom is crowded, the coffee cups are full and the questions are flowing. Sales targets, revenue forecasting and monthly figures are high on the agenda, yet as is commonplace across organisations of all shapes and sizes, straight questions seldom yield straight answers. Because a simple request such as getting an answer from a question asked to a colleague can take several minutes. With so many options to communicate these days, businesses can often take the longer step of sending an email instead of addressing a person directly. The industry today however has become accustomed to asking questions virtually, to assistants such as Siri from Apple, Cortana from Microsoft or Alexa from Amazon. Closer to home, businesses are also used to tapping the real-time brains of Alex, the virtual assistant now at the service of the Australian Taxation Office website. But a disconnect still exists — organisations have quickly realised the value of data, yet remain challenged to maximise such information, with blockades in place when attempting to extract insight. 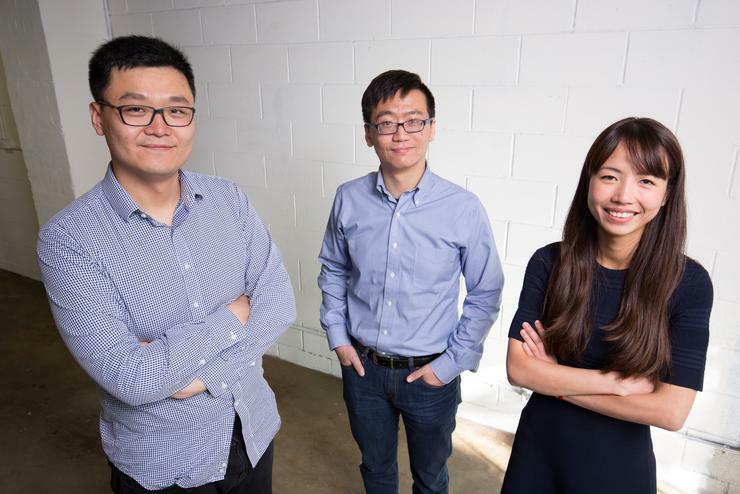 Coupled with a lack of data scientists active in the local market — especially within financial services — one Australian start-up is facing industry giants through game- changing software. Introducing Hyper Anna, a machine learning virtual agent that works as a data scientist. Launched in February 2016, the Sydney-based business operates as a modern-day artificial intelligence company, with interacting with Anna akin to interacting with a work colleague. Specifically, users can quiz the virtual assistant via text, email or by asking a question to a mobile interface, in the same way as current market offerings. Housing the capability to address several requests at any given time, the software returns insights to a user in as little as six seconds. Alongside fellow co-founder Sam Zheng, both hold experience as data scientists, which in turn provided the inspiration to develop an application in the form of Hyper Anna. According to Nguyen, the software automates analytics processes, allowing employees to ask complex questions without the need to reach out to a data scientist. Currently, the application — which is built on the Microsoft Azure platform — is designed to answer questions in plain English but, with plans of expanding into China and other Asian markets, other languages will be available soon. “There are three ways to interact with Anna, you can either go into a website and basically the data has been piped directly to Anna’s brain and sits in an Azure cloud, then you can ask a question in the website,” Nguyen added. “Or you can cc Anna in an email conversation, so say for example if you email me saying there is a talk at 4pm today about your sales performance and you cc Anna in that conversation, Anna can read from the email context and understand that you will need some information about my sales performance and then email that information. As organisations become suffocated by the vast amounts of data swarming throughout the business, a realisation is fast emerging around lack of visibility for employees. “This means they might not have the skill set, or they might need access to the business analytics team to actually get access to the data,” Nguyen added. “It is very time consuming and costly to have a large team of data scientists in an organisation. If the business was to have a mission statement, according to Nguyen, Hyper Anna was created with the idea that all businesses deserve to have access to a data scientist to drive value from data, regardless of size or scope. And by working 24x7, alongside the ability to answer 43 questions per second, the application exceeds the capabilities of a data scientist on every level. But this wasn’t created to automate and effectively steal jobs, rather to free up data scientists to focus on more innovative and mission-critical endeavours inside the organisation. Due to machine learning technology that underpins the system, Nguyen said insights delivered are sculpted to reflect the real intent of the question. “When humans ask a question we always have an intention for the question,” she added. “If you have asked me ‘how are my sales doing?’ and I told you that you had sold $100,000 of product, that is actually not very insightful at all. Despite being only 18 months old, Hyper Anna has already received international recognition, after being acknowledged as a cool vendor by Gartner, across the AI for Banking and Investment Services category. As outlined in the analyst brief, the business is deemed cool because it allows any person in an organisation to ask complex questions of a company's dataset in plain English and get an insightful response. “It is a smart machine agent that performs the role of a data scientist,” Gartner analyst Derry Finkeldey observed.